The Aviation Division was created in the late 1930s to help wardens enforce Maine's fish and wildlife laws. In a state as unique and remote as Maine, an aircraft's speed and vantage point is an efficient, and sometimes the only, method of detecting activity. Today, the division is composed of three full-time pilots, each of whom is also a sworn Game Warden. Each day, Warden Pilots quickly locate areas of activity and pass this information on to the corresponding District Warden. This information allows wardens to more efficiently plan their day, focusing their efforts on areas of high resource usage and saving time and vehicle miles. The division's three aircraft are seasonally equipped with wheels, pontoons, or skis, allowing Warden Pilots to land on Maine's several thousand lakes, rivers, ponds, and suitable roads to directly address fish and wildlife law violations. Warden Pilots are instrumental to the bureau's search and rescue efforts. They are one of the most-often called resources in the state, primarily due to their extensive geographical knowledge of the state from the air and their ability to reach remote areas year-round. Warden pilots fly upwards of 250 hours a year on such calls, and have been responsible for saving many lives within our woods and cold waters. The Aviation Division also supports the bureau's resource management efforts through aerial fish stocking and various data collection efforts. Aerial stocking is the least stressful method of delivering live trout and salmon to inaccessible or distant locations, Maine's Warden Pilots release more than 182,000 of them — over 28,000 lbs. — into 195+ lakes and ponds each year. Data collection efforts include the Bald Eagle census, deeryard surveys, telemetry flights of radio-collared Black Bear and Lynx, and summer and winter angler surveys to determine inland fishing pressure. The Maine Warden Service Dive Team was formed in 1962 to help the bureau carry out a particularly complex and technically difficult statutory responsibility: conducting underwater searches for persons presumed to be drowned in Maine's inland waters. Since then, it has grown to become a specialized, well-trained, and well-equipped team of ten Wardens, including a Dive Team Administrator and a Dive Team Trainer. While its operations are still primarily focused on the inland waters of the state, the Dive Team is also frequently called to assist its Maine State Police and Maine Marine Patrol counterparts with saltwater victim recovery efforts. 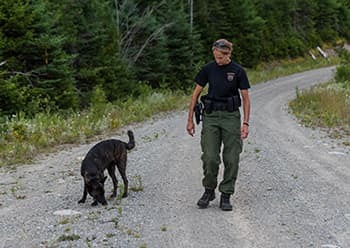 The Maine Warden Service K-9 program began in 1980, following promising research by Game Warden Specialist Deborah Palman into the ability of K-9s to assist wardens with both search and rescue missions and conservation law enforcement. Under Specialist Palman's leadership, the unit grew in the 1990s to 10 K-9 teams. Today, the K-9 program is overseen by Corporal Michelle Merrified. Team training positions are currently held by Warden Jeremy Judd and Warden Paul Farrington. Over the years, the Maine Warden Service K-9s have been an invaluable resource, responsible for finding countless lost persons and solving numerous fish and game cases. We also assist other agencies with criminal investigations. In fact, Maine Warden Service K-9 teams have earned such a positive reputation that they are often requested to travel abroad to assist other states and countries. One of the unit's biggest human remains recovery missions was in New Orleans after Hurricane Katrina. To get their initial certification with the Maine Criminal Justice Academy, Maine Warden Service K-9s and handlers train for a minimum of 320 hours under the direct supervision of a Maine Criminal Justice Academy certified trainer, and must complete a field test. To maintain their certification, they must train for 16+ hrs. every month and pass a field test every year. The Maine Warden Service's Wildlife Crimes Investigation Division (WCID) consists of four Game Warden Investigators and one administrative support person, supervised by the Game Warden Captain. Each Investigator supports the efforts of four sergeants and roughly 24 Game Wardens. The focus of the WCID is to coordinate investigations into serious personal injury and fatal hunting-related incidents as well as ATV, snowmobile, and boat crashes. They provide resources and support to district Game Wardens managing these incidents, and also assist them with more complex fish and wildlife investigations. Their duties include preparation and execution of search warrants, gathering suspect information, researching criminal histories, providing investigative support during extensive search and rescue operations, and maintaining a network of contacts to facilitate interstate investigations when visitors of Maine violate our fish and wildlife laws and return to their home state. They also serve as liaisons to their Federal counterparts, the U.S. Fish and Wildlife Special Agents. Investigators are promoted from within the ranks of district Game Wardens. The Maine Warden Service Evidence Recovery Team (ERT) was formed in 2008. The team presently consists of six active evidence recovery technicians, all trained in crime scene processing and issued the most modern equipment. Within the crime scene processing discipline are more specific disciplines involving DNA handling, blood spatter analysis, and crime scene photography, to name a few. The Maine Warden Service ERT is an associate member of the Maine State Police Evidence Recovery Team. Members routinely train with their State Police counterparts to stay on the cutting edge of CSI. The Maine Warden Service Firearms Team is responsible for training the 125 members of the Warden Service in firearms use. The team consists of 10 instructors, one Administrative Team Leader, and one Training Team Leader. This highly-credentialed team has received training from the Maine Criminal Justice Academy, Sig Arms Academy, Action Target, Street Survival training, and the Maine State Police Tactical Team, just to name a few, and is often called to assist local police departments, state law enforcement agencies, and federal law enforcement agencies with their training efforts. The training that the Firearms Team conducts for the Warden Service each year includes handgun / shotgun training and qualification (per Maine Criminal Justice Academy qualifications and tactical training, rifle training, and interactive use of force training. Interactive use of force training is scenario-based and utilizes specialized safety equipment as well as firearms that are converted to fire non-lethal colored marking rounds. The scenarios range from a simple license check of a hunter to a takedown of a robbery suspect. During these scenarios, the warden is evaluated in several different areas ranging from verbal communications to controlling the suspect during an arrest. This trains Game Wardens to cover all levels of use of force in real-life scenarios, helping them develop the skills, knowledge, and attitude they will need to stay safe while performing their law enforcement duties. The Maine Warden Service Forensic Mapping Team is a specialty team made up of Game Wardens with special training in the use of forensic mapping equipment and MapScenes diagram software. The team utilizes Leica Total Stations and MapScenes Archer data collectors to capture data points, including precise distances and angles, at serious crash and crime scenes. These include recreational vehicle crash scenes, fish and wildlife violation scenes, hunting incident scenes, motor vehicle crashes and other crime scenes. The team also assists local police departments, sheriff departments, and other state law enforcement agencies with crime and accident scene mapping, working closely with the Maine State Police Traffic Crash Analysis Unit, forensic mappers, and accident reconstructionists. The Maine Warden Service Honor Guard is set up to consist of up to 16 Game Wardens. Rank is not a consideration, and the current Honor Guard membership consists of District Game Wardens, Sergeants, one Lieutenant and the Major. The Honor Guard is divided into two teams — a Northern Team and a Southern Team — each of which is headed up by a Commander, whose job is to set up and coordinate all of the functions that the Honor Guard is called on to perform. These include honoring retired Wardens who have passed away by sending a detail to attend their funeral, taking the lead in organizing any memorial services for a Warden that has died in the line of duty, attending Warden School graduation, conducting the opening ceremonies to the Warden Service's Annual Awards ceremony, attending funeral services for other fallen officers from other agencies, marching in various parades when requested, participating in the annual Special Olympics ceremonies at the University of Maine in Orono, and leading the Wardens attending the annual Fallen Officers' Memorial. One member of the Maine Warden Service Honor Guard also marches with the multi-jurisdictional Honor Guard during the Fallen Officers' Memorial ceremonies. The Warden Service Honor Guard has sent members to New Jersey, Connecticut, Massachusetts and New Hampshire to attend funeral services and sportsmen shows. Several years ago, the Honor Guard was invited to conduct the opening ceremonies of a Portland Seadogs game at Hadlock Field in Portland. Whenever the commissioner receives notification that any person has gone into the woodlands or onto the inland waters of the State on a hunting, fishing or other trip and has become lost, stranded or drowned, the commissioner shall exercise the authority to take reasonable steps to ensure the safe and timely recovery of that person. The Maine Warden Service receives nearly 500 calls for search and rescue service every year. Game Wardens respond to most of these search calls, which often include lost children in rural areas, overdue hikers or snowmobilers, missing Alzheimer's patients, and missing despondent individuals. In the 1980s, the Maine Warden Service Incident Management Team (IMT) was created to manage large-scale and high-priority searches that would be difficult for Game Wardens to manage on their own. The team is deployed for about 10 or 15 such searches each year. IMT uses ICS/NIMS principals and regularly assists other law enforcement agencies in the state with their large-scale searches, working with both the CID unit and the Maine State Police on missing person cases. This specialized team is constantly improving. Members regularly attend nationally-recognized search and rescue training programs, and IMT has replaced its 24k topo map/compass and pacing techniques with GIS-based mapping software and GPS technology in the field. This combination allows for more precise placement of resources in the search area and better documentation of where those resources actually searched.